Does Your Content Strategy for E-commerce Cover All the Bases? Building a content strategy for e-commerce starts with crafting unique, keyword-rich and benefit-focused product content. But that’s just the start of the process. You need to get that content in front of your prospective audience, charm them into making a purchase, and leverage their feedback to boost your brand. Retailers that want to build a strong following take a multi-pronged approach to using content to boost sales. Here are a few ideas to draw more attention to your brand and drive increased revenue from e-commerce. From LikeItWantIt to Snapppt, the e-commerce ecosystem is overflowing with technology that helps convert social media followers into paying customers. But enabling Instagram or Pinterest users to impulsively buy products while they are in the grips of compelling photos is just the beginning. For e-commerce companies that want to get the most out of their content marketing, the next step is bringing users into the fold and making them partners. Companies like To The Tens are making it possible for users to generate and share content, including photos and videos, that link directly to products on e-commerce websites, driving traffic and letting content creators reap a bit of the profits. Affiliate links have been around for a long time, but this new generation of “contextual commerce” is much more sophisticated. 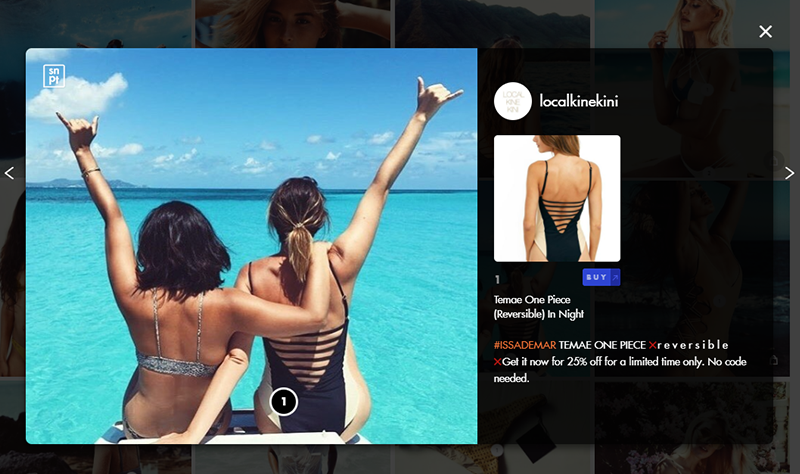 User-generated content can play an important role in driving customers to your site, and it’s worth exploring ways to make this happen. A few years ago, video was touted as the biggest thing coming down the road for branding and social selling. That prediction proved true. YouTube is exploding as a viable marketing channel for businesses, and companies are incorporating video onto their own websites to engage and inform customers. But static video content is only part of the picture. If your company hasn’t done a Facebook Live broadcast, it’s time to give it a try. Right now, Facebook is strongly encouraging this type of marketing (which means they will likely show it to more people compared to your standard content). Unlike Instagram and Pinterest content, which should be highly polished (with magazine-quality photography), Facebook Live videos are about being casual. A smartphone with a clean lens is all that’s required. Customers are craving personable, authentic content. Adding the live element to make it time-sensitive, especially if special deals are being offered, can help attract consumers who are primed to make a purchase. You can also make these live feeds part of your content library by publishing them after the event is over. A tour of your facility, answers to FAQs, and product launches are all good topics for live videos. Get more ideas at SmallBizTrends.com. As a content strategist, you should be part of every discussion that involves your brand. Responding to content that is written by others is essential for reputation management. You may not be able to control the conversation, but you can’t afford to ignore it. Start with real-time moderation of the user-generated content on your company’s own website. This protects your customers, your employees and your brand from illegal, offensive or inflammatory content that could offend or harm. You should also track relevant conversations on both established and emerging social media platforms as well as review sites. To help you monitor these conversations, set up Google Alerts to notify you when a blog or other web content is published that mentions your company’s name. This user-generated content is just as critical as the blogs, Instagram photos and LinkedIn posts your company publishes. What your spokesperson says (or doesn’t say) in response to questions, comments or complaints in an open forum online is part of your brand. It tells prospective customers and loyal followers that you are paying attention to what they say. No matter where you’re planning to go with your content strategy for e-commerce, we’re here to help. View a demo and find out how easy it is to make OneSpace part of your solution.